One home-ec class in middle school turned me to my first crafty skill: plastic canvas. I knew my grandmother did this stuff religiously (ornaments, crosses, dolls, broaches, jewelry, you name it she had something for every occasion or just because), but I thought it was such a "grandma thing to do." My home-ec teacher - probably a grandma herself - had us kids make tiny little boxes with little lids we could tie down with a yarn bow. After that assignment, I was making so many of those little boxes on my own that I ended up giving some to friends as Christmas gifts later on in the year (with a cheesy poem in them and everything). 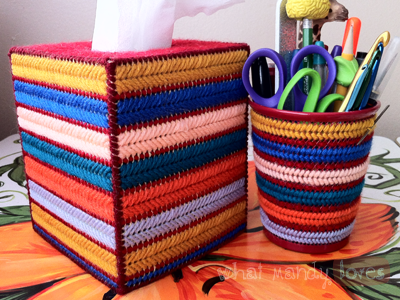 After learning new stitches and practicing patterns, I was covering every single tissue box in the house a few times over which I'm sure drove my family nuts. There was always something to weave yarn through or cover with mesh and a fancy pattern. In my own apartment now, this is no different. 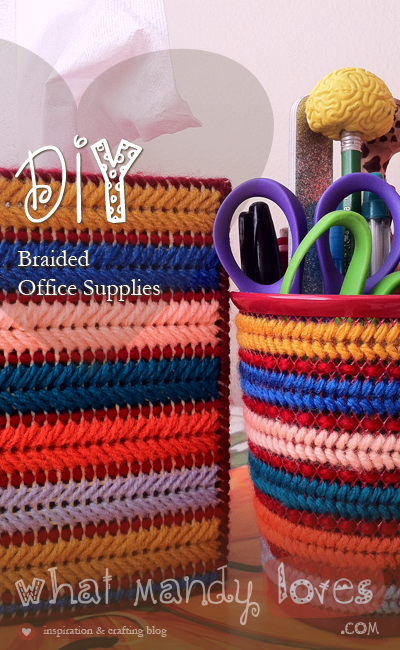 This office supply DIY combines plastic canvas with weaving into metal mesh of a pencil cup. 1. For the tissue box sleeve, lay a plastic canvas sheet over one of the tissue box and cut around the dimensions of the tissue box. Repeat this for all five total sides including the top piece. Leave one or two extra grids or rows padding when cutting so the finished product will slide right on and won't be too snug. Make sure the top piece's dimensions match the top of each four sides. Since I did a square box, all four main sides are the same size and the top is a perfect square of the same dimensions at the top of each four sides. Rectangular ones will have two large sides, two small sides, and the top piece will match both widths of the small and large pieces. With the top piece, center it out on the top of the tissue box, lightly trace with permanent marker where you want the tissue hole to be, and cut it out of the center. It can be a square, diamond, or any funky shape you want as long as its wide enough for the tissue to be pulled out. 2. Pick the color or colors out of your yarn stash you wish to use for your braided pattern. Starting at the top corner of any of the mesh squares, thread your needle in a diagonal direction in and out of the mesh grid similar to this: ///////////// I use three mesh rows for the first half. At the end of the row, jump down below it to finish off the "braid" part in the same number of rows but in the opposite direction similar to this: \\\\\\\\\\\\\ The harsher the diagonal line you use, the more harsh the braid will be (think a fishtail braid). I do a perfect diagonal in the three-row mesh (3-3) to go for this look but you could do a 4-3, 5-3, etc to go for a sharper point in the braid. 4. Continue this for all four main sides of the tissue box. You could also use this on the top square, but I kept it a solid red to match the gap color. Stitch the pieces together starting from the top square at the tops of each main squares and then stitch the sides down to form the box. I'd stitch a row at the end of each main square as well to finish it off. 5. For the pencil cup, I used the same braided technique for step 2 of the tissue box (with a 2-2 diagonal ratio) only I skipped a row since the gaps in the metal grid are not as prominent as the plastic mesh (i.e. the holes are smaller). I mimicked the colors of the tissue box and filled in the gap color last. NOTE: Be aware of what the pencil cup's main color could do to your pattern or compliment the pattern with the base color of the cup in mind beforehand. Mine is red so choosing the red gap color made sense. You may need to spray paint your pencil cup a different color before you begin sewing in the braided pattern, but that's entirely up to you. If you're stumped on my directions or you just need some imagery to help you out, there's this neat tutorial on how to make craft boxes from makezine.com that I'd recommend reading. 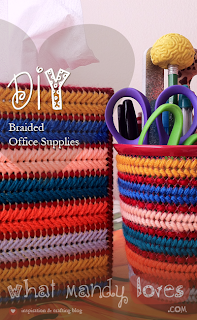 AND you can use this tutorial to add to the two office supply pieces in my DIY! Win-win. How'd ya do? How would you match your office supplies like these? Let me know in the comments. These are so cute! What a great way to jazz up otherwise boring office supplies!